NiteCore D10SP (XP-E R2) Review: RUNTIMES, BEAMSHOTS, and more! Thread: NiteCore D10SP (XP-E R2) Review: RUNTIMES, BEAMSHOTS, and more! 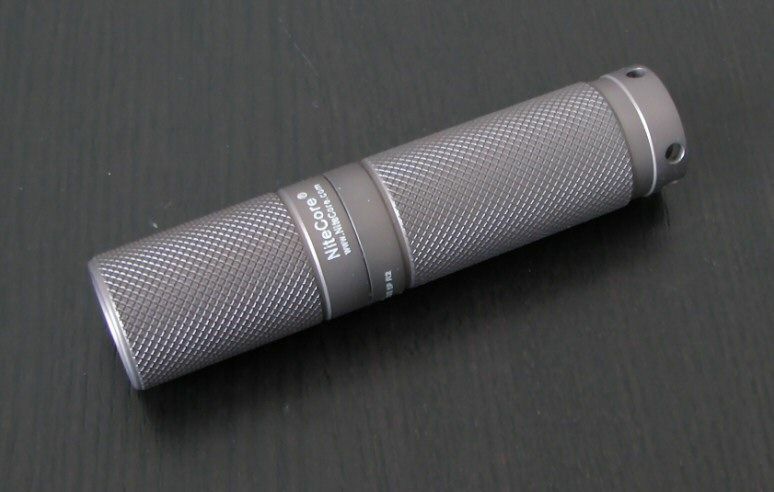 Reviewer's Note: The D10SP was provided for review by NiteCore. Please see their website for more info. Packaging has been updated, and the light now comes in a longer cardboard box with cardboard/paper insert. Inside comes the light, good quality wrist strap, extra o-rings, pocket clip screws and allen key (though oddly no clip on my sample), warranty card and manual. 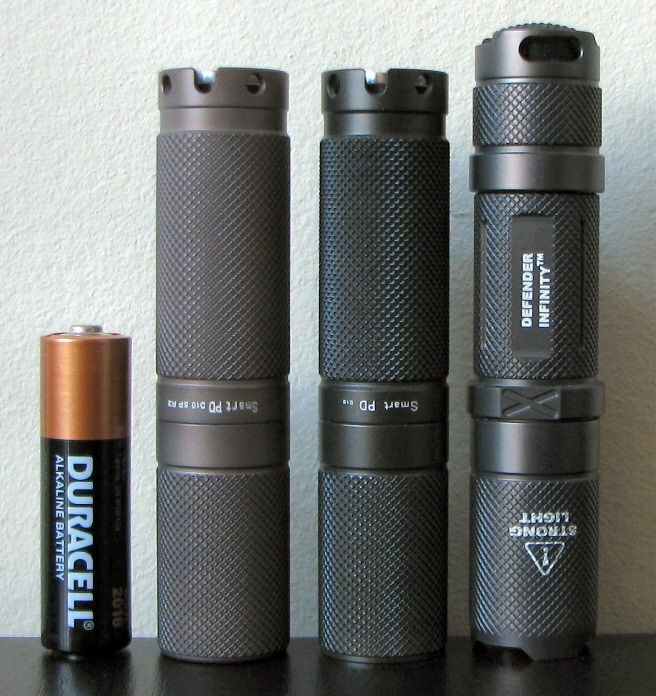 From left to right: Duracell AA, NiteCore D10SP, D10 (Q5), NDI (Q5). 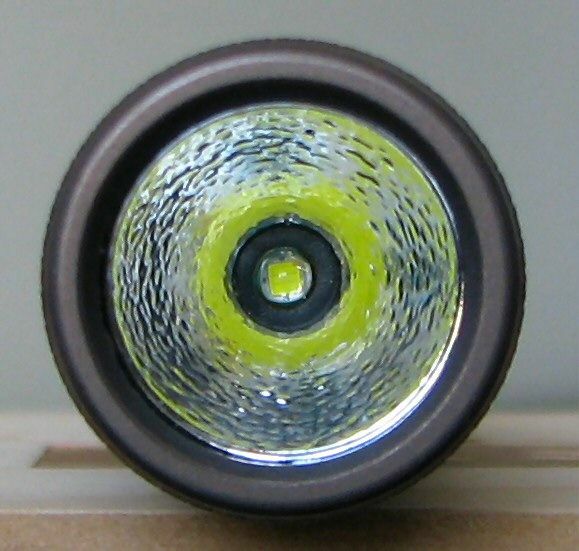 Overall dimensions don’t seem any different than the original D10 lights. The hard anodized (type III) finish has changed – the SP has a sandy-brown grey colour, compared to the earlier charcoal-dark grey D10 finish. Machining and anodizing quality remain high on my sample. Aside from color change, the additional "SP R2" label after the D10 is the only obvious external body difference. Labels are reasonably clear, although I still find them a little small (my eyes must be getting old ). The emitter is of course upgraded – no longer using a Cree XR-E or GDP, these new D10SPs have the now standard Cree XP-E (R2). Inside is where things begin to change a little. The contact board in the head is a different colour now, and the piston has a greater protruding button-end, where the o-ring is now located. I don’t find the press-feel of the light any different, so I’m not clear on the reason for the change (i.e. doesn’t really make a difference ergonomically). The light can still tailstand. As before, the light still comes with a textured OP reflector (although the texturing seems a little heavier now). Note the new XP-E emitter. And now for the requisite white wall hunting … all lights are on Max with on Sanyo Eneloop, about 0.5 meters from a white wall. Beam pattern is fairly pleasing, without the standard Cree rings of the earlier XR-E model, or the color distortions of the GDP. Tint is pretty good on my sample, maybe just slightly on the purplish side of premium cool white (of course, YMMV). For those of you not familiar with tint bins, please see my Colour tint comparison and the summary LED tint charts found here. The multi-mode D10SP features a revised interface over the previously continuously-variable original D10. Now, when you press and hold the piston down, the light rapidly moves through only 3 output modes instead of the previous 100+ continuously-variable ones. Time to cycle through them is now about 2 secs instead of ~8 secs on the older version. “Shortcuts” no longer jump you to Max (click-press) or Min (click-click) as they did previously on the original D10. On the D10SP, click-press now brings you a strobe mode, and click-click brings you to a SOS mode. Note that these shortcuts are basically toggles – do it again, and you are back to constant output. You can basically consider these as “hidden modes” for regular usage. The strobe mode is very fast 14Hz. Light has mode memory, and retains last output setting chosen. The light can now be locked out – press and hold the switch from off for 1 sec. A brief flash will indicate the light is locked out. To release the lock, do 3 quick flashes. This circuit feature was not available on the previous D10 versions, and is a welcome addition to allow you to prevent accidental activation. Although not visible to the naked eye, the light does uses PWM for its low modes, which I dectected at 7.8 kHz on Lo and Med. I also detected a 14.6 kHz signal on Hi, but my system doesn’t let me resolve that high a frequency to confirm (it may just be some sort of high freq pulse). Either way, these are excellent PWM freqs. As expected, max output on Eneloop is a little higher with the R2-equipped D10SP, compared to earlier versions. Note that the Lo mode is not as low as the previous versions were capable of. Although hard to compare given the output differences, it seems like the overall efficiency of the SP version is lower at the Max setting (especially on standard batteries - eneloop, L91, alkaline), and higher on the Med setting (especially on 3.7V 14500 Li-ion). Build-wise, nothing significant from previous versions. 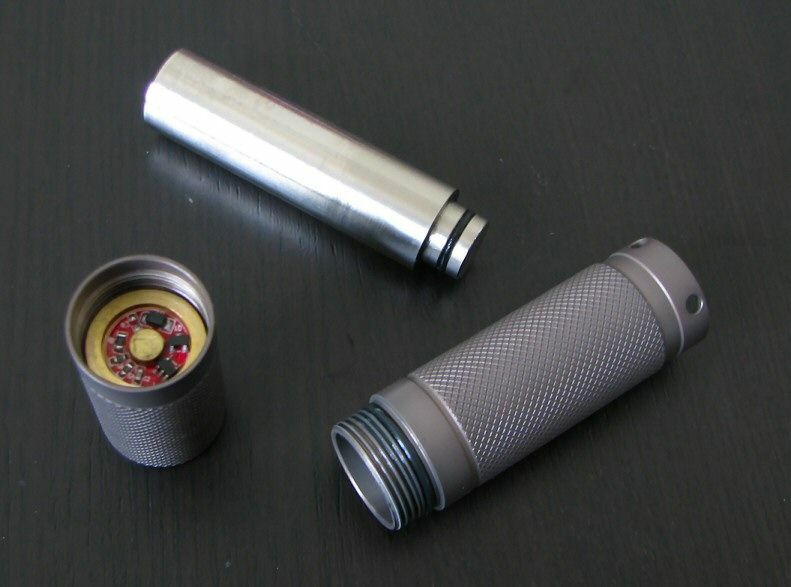 Note that all NiteCore "piston-drive" lights tend to have somewhat stiffer operation than traditional clicky switches. When in momentary mode, if you depress the switch for more than 0.5secs, you will start cycling through output levels (i.e. effectively, there is no momentary mode as such). Contrary to specs, the D10SP Lo output is not as low as my earlier D10 lights. According to my lightbox, on Lo the new SP is approximately three times brighter on Eneloop, and five times brighter on 14500. I believe the original D10 was well under 1 lumen on Lo, despite the original 3 lumen spec (the new D10SP's 2 lumen estimate seems reasonably accurate to me). SOS speed is rather fast (i.e. faster than you would be able to signal in a true momentary light). The D10SP is basically a revised D10 light that forgoes the continuously-variable ramp in favour of 3 defined output modes and the addition of SOS and strobe modes on the "shortcuts" (i.e. click-press, double-click). Although there are a couple of minor build updates (i.e. position of the o-ring on the piston, contact surface in the head, new anodizing colour) and a few nice new features (i.e. circuit lock-out option, higher output X-PE emitter with smoother beam pattern), these are really more evolutionary than revolutionary. It is up to you whether you see the addition of strobe and SOS modes (and loss of continuously-variable mode) in the D10SP as an upgrade. Overall efficiency of the D10SP’s Hi output appears to have dropped (especially on standard batteries - NiMH/alkaline/L91), but improved on Med mode (at least on 14500). And contrary to the reported specs, the min output of the new SP version is considerably brighter than the min output of the original D10s in my testing (i.e. 3-5 times brighter, depending on battery). I haven't done runtimes at these Lo levels. Personally, I prefer the original continuously-variable ramp version (with its lower low), as I never use tactical strobe or SOS anyway. But the simplified 3-level output may be sufficient for a lot of people, and the "hidden" SOS/strobe does provide an option for those who want it. I also like the absence of Cree rings with these new XP-E emitters. Hopefully the direct comparison of output, runtime and beam patterns above will help you make a choice between the various D10 models. P.S. I understand that while NiteCore has officially discontinued the regular D10 version, they continue to make the D10 UI available to certain dealers (with the new XP-E R2 emitter/reflector). If you look around, you may be able to find one (e.g. there is at least one Hong Kong-based eBay vendor who seems to offer it ... ). Last edited by selfbuilt; 03-29-2010 at 01:16 PM. Re: NiteCore D10SP (XP-E R2) Review: RUNTIMES, BEAMSHOTS, and more! Wow.. I was waiting for this review. Many thanks! Surely Zeruel will add it to the D10 tribute. Thanks. Sorry for the delay in getting this one up, but I'm a bit backlogged with lights right now. Selfbuilt, would you prefer the d10sp, instead of the d10 ? It's added in under Reviews, Dioni. My Lights | This auction is a straight baller son! I also have one and I loved mine, especially the lockout function. But there is just a stupid design fault in it, if you have it in lockout mode and you tap the piston side on to your hand or something else the light will come on because the battery disconnects and connects again. I think it could be solved with a better spring but this is the reason I don't use mine anymore. "Query,What shall I do with the organic meat bags Master?" FYI, NiteCore informs me that they do continue to make lights with the original D10 user interface for a few dealers (and with the new XP-E emitter/reflector). Personally, I think that's a winning combination. I just wish they would update the regular D10 with ramping UI with an XPG R5. Love my D10 Q5 but wish for no rings and 50% more output with a wider spot--swapping to a XP-G R5 would do this. Maybe Nitecore is waiting for the neutral XP-G R5 LEDs from Cree? Imagine a neutral XP-G R5 larger, smooth spot with the classic ramping D10? Peak Pacific AAA UP brass (EDC) E01 (keys), Peaks, Arcs, Fenix, Q5 Aspheric HA-III Mag etc. I have had a EX-10Q5, R2, GDP & D10 GDP, Q5, R2 and now EX-10 SP R2. The large hotspot, improved beam with no rings etc is such a huge improvement over the Q5 & R2 models its laughable. Personally, I considered the press/hold ramp up/down of the old model as too slow (8 seconds is too long). Plus with the odd press/hold & nothing happens scenario every now & then was a bit frustrating. My most used light level was always medium. With the old model, if you double clicked for low or click/hold for high, you then had to hold (4 seconds) each time to get back to an approximate medium level. IMHO, the new models' Lo/Med/Hi is quicker and more convenient. The button lock is also a great feature. I don't know how many people were complaining of 'hot pockets' with the old version. I agree that they should have left out the blinky modes as I never use them. Don't get me wrong, I for one am the sort of person that is resistant to change. 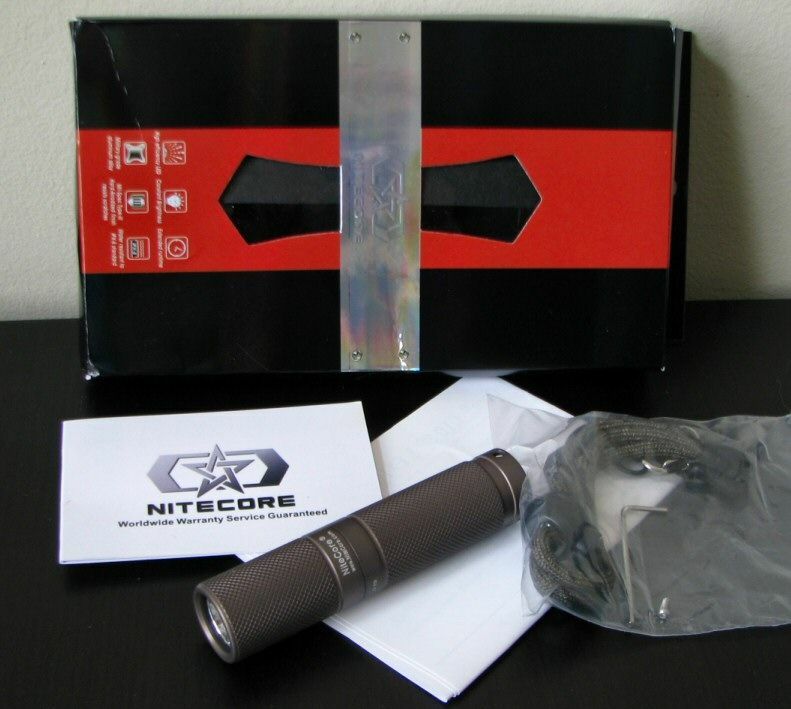 I always liked the feel/look & design of the original Nitecore EX-10/D10 lights. I do however, consider the new UI & emitter/reflector as an improvement over the original model. 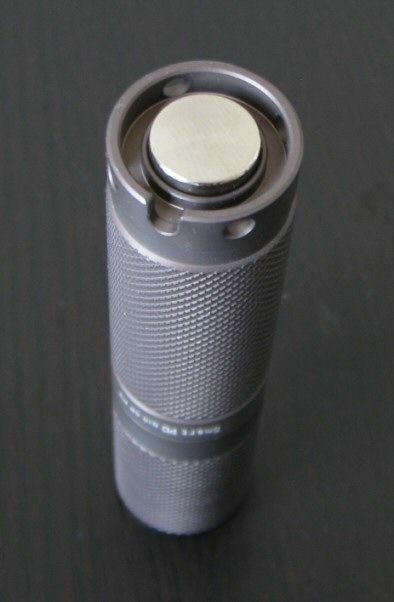 I do wish Nitecore would stop calling their clip stainless steel - it definately is not - chrome plated maybe. Last edited by jimmy1970; 03-30-2010 at 12:14 AM. I just picked up an EX10 SP with a Q3 5A emitter. These are also available in the D10, so I thought I'd chime in. Be forwarned. The good news is: the tint is warm and pleasant, and the high is still pretty darn high. I don't think I'll be loosing sleep over the lower output of the Q3 vs. the R2. The bad news is: the beam isn't exactly clean and artifact free. This may be due to the fact that the Q3 is an XR-E, while the reflector in the SP is designed for an XP-E. Or perhaps it has to do with the stainless bezel ring. So if you are into pretty white-wall beam profiles, you may not be happy. In reality, though, the artifacts are mostly in the outer spill, and outdoors, they aren't enough to notice. It does take a little while to get used to the piston drive. Longer than say, learning the NovaTac click-press routine. But once you have it, it actually works pretty well. I noticed on my EX10 that if you loosen the head a full turn to go into "momentary" mode, true momentary does work. You just have to depress the piston only about half of it's travel, and it won't switch light levels. Push it all the way, and you start level-changing. My piston seems a bit stiff, so I sometimes find myself goofing. Do you have any suggestions for proper cleaning and lubing of the D10/EX10 pistons? I notice a mild inductor(?) whine only on the medium level. Odd. Never a heard a flashlight make noise before. I don't notice it unless I try to listen for it. 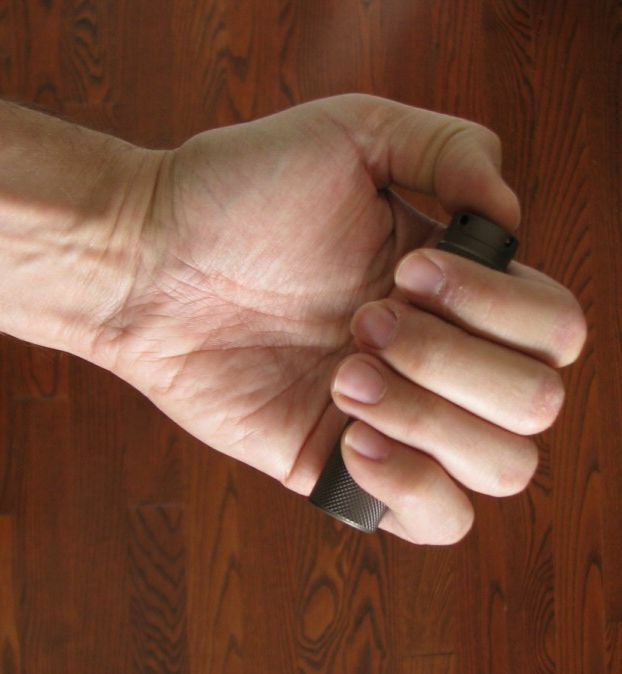 The light has good knurling, but won't cut up your clothes. Nice clip, if yo don't drive yourself nuts trying to install it. With it's size, clip and lack of sharp edges, a good light to carry if you wear a suit. Now my "dress" EDC. I've found I like the EX10 SP, and will probably pick up a D10 SP with the R2 XP-E to get an AA light and to see if I like that nice beam, hoping it might rival my NovaTac 85's. Thanks for detailed comments on your experience with the EX10 SP. As for the beam, I would have thought that they would have stuck with the original XR-E reflector on the warm versions, but who knows? XR-E are indeed prone to more rings. For the lube, I find something of lower viscosity works best on the D10/EX10 lights (e.g. teflon oil). But lower viscosity lubes tend to wear off faster, so you need to re-apply more often. Anyway you slice it though, the piston is stiffer than a traditional clicky switch. As for inductor whine, I wish it were a rare occurence in flashlights! I come across it frequently on lights I review - at varying intensities, and usually only on certain outputs on certain battery types. In my experience, it is pretty random in its presentation - one light can be inaudible, while another sample is constantly distracting. But the good news it that is fairly rare to have a really distracting sample - in only a handful of cases have I found it so bad as to not to want to use the light. Hmm, beyond the usual suggestion of a full and proper cleaning of the threads and all contact surfaces, I don't know what else to suggest. If that doesn't do, I would contact your dealer/Nitecore for a RMA. i recently bought a nitecore d10 sp version and i got to say. the quality control of the light was decent, for one, my o-rings were completely ripped in half and the emitter head was off centered. i also realized that in the low and medium mode the flashlight makes a very distinctive high pitched noise that is very noticeable. even after sending the flashlight back to be fixed, the noise was still there. i was intending to use this flashlight on a headband and now im feeling discouraged to do so. does anyone else have this issue also? The high pitched noise is known as inductor whine, and it is virtually impossible to predict when it will occur. 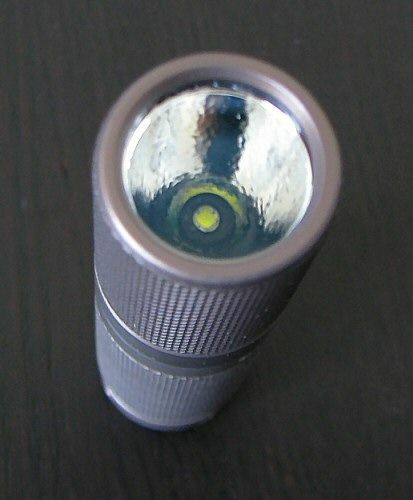 All flashlights can suffer from it, although certain models of lights do seem to be more prone than others (may have to do with how close the components are layed out on the circuit board). Any given light tends to be very consistent in when (and how loud) it is produced - in some cases, only on certain modes with certain batteries, in other cases more broadly. In most cases, it usually isn't too loud. If you find the whine significantly distracting, I would suggest trying to RMA again on this issue (sounds like they just sent you back the same light previously?). But it is unfortunately somewhat luck-of-the-draw with any light.